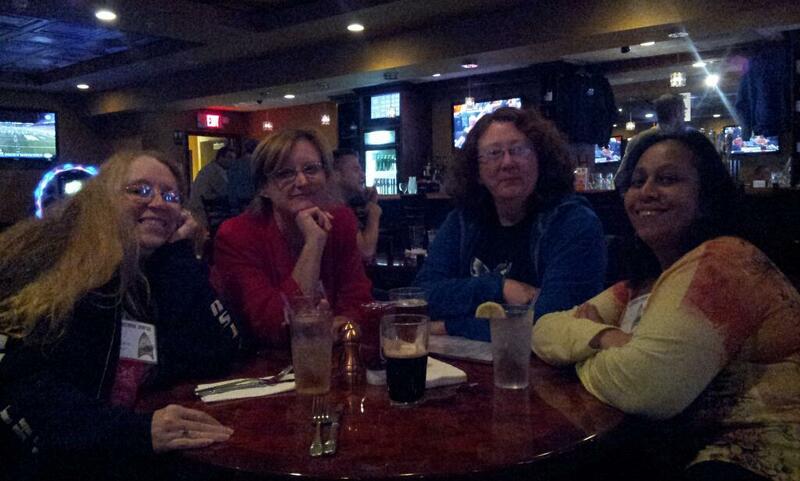 This past weekend I attended Albacon, the local speculative fiction con. It’s always a great opportunity to catch up with friends and meet new ones. There are so many changes in publishing — and so much anxiety about the changes — that there was a significant amount of soothsaying and bet hedging going on at all the panels. In the midst of one late panel I got a text from Bertie telling me he was chatting with Wallace Shawn at the Gossip Girl final wrap party. (-_-) Always one up on me! Debi dressed us in saris Saturday night; we had late readings both Friday and Saturday night. I yammered on a variety of panels: publicity, publishing and how crazy it all is now, humour in spec fic, and the hilariously titled ‘Details’ panel for which we were given no details as to what it was supposed to be about. I ran out on Saturday to the Sisters in Crime meeting (and managed to bring the president, Kay, back to Albacon — here’s to reaching across genre lines!) so I could meet Alice Loweecey, who was speaking about her series of mysteries featuring an ex-nun (a role she knows from the inside out). Not only was she an absolute delight — I bought her books on the assumption that they will be as much fun as she was — but she had a Barbie doll dressed as a nun as a door prize! Guess who won? 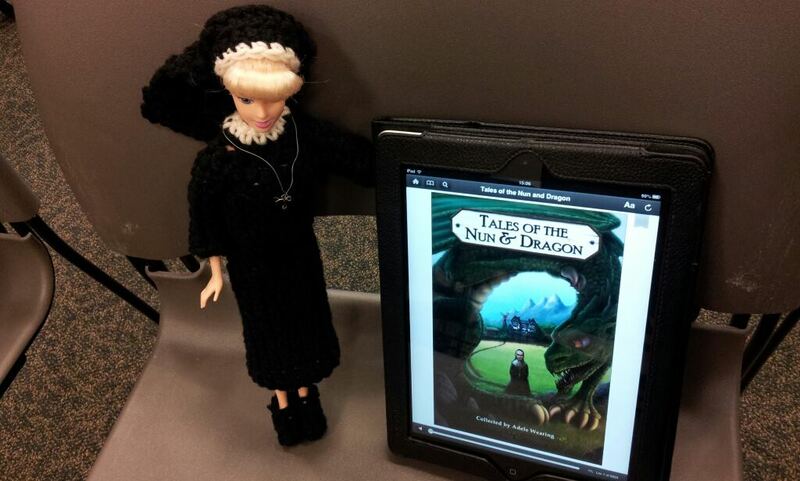 So if course I had to add her to the folks found reading Tales of the Nun and Dragon. Thanks to the folks who made Albacon fun. You sound as if you’re having altogether too much fun, m’Lady !! :):) enjoy your posts immensely ..:):) Da Lady Can Rite ! Dammit, Laity. Here I am feeling somewhat smug–if harried!–about the balancing act I call my life. And you–you beast of an owl–are having so much fun, when I am merely balancing. Your magic is very powerful indeed.